Is it a bird? Is it a plane? No… actually, wrong. Let’s try this again. Is it a bag? Is it a sleeve? Is it a case? Actually, it is a bit of everything. This is a sleeve type case for your Macbook/Macbook Pro for sizes up to 15.6″. To top that up, it also features handles, so you can carry it on its own, or put it in your hand luggage while travelling. A good question, and a worthy answer! This sleeve not only gives you physical protection from bumps as well as scratches, it goes a lot further than that, being weather proof. Yeah, this is both water resistant as well as dust resistant. 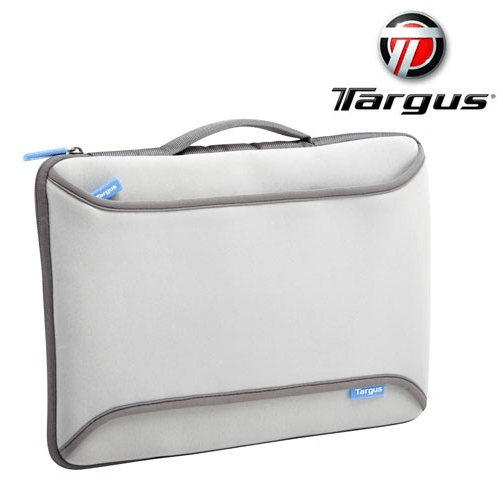 Targus put in good quality zips to ensure that nothing leaks in, and all the elements stay out! Can I squeeze in other things apart from my Macbook? Unfortunately, not much. Unless you mean a paper or two. It is quite a snug fit, but this is only to make sure that the sleeve provides a good protection overall. Macbooks? What about other laptops? The answer to that totally depends on what your laptop is, but sadly, the deciding factor here is the thickness of your device, even if it is under 15.6″. Macbooks are very slim, and that makes them ideal for this bag. Slim laptops would fit, but my regular Dell laptop doesn’t. Yes. It looks great, and has a soft touch. I like it, how do I get it? It retails for £24.95, and so great is its value, that at the time of writing, it is already sold out! Not much at fault for this device. Not only does it give you protection, but the fact that it is waterproof means that you don’t have to worry about balancing that takeaway meal on top of your Macbook. A great price just adds to the value. Only problem being that it doesn’t fit all laptops of 15.6″ screen sizes. However, if you carry a Macbook/Macbook Pro with yourself, this only adds to your stylish look. Previous story Apple give away Games and Apps, a gift for the App store’s 5th Anniversary!